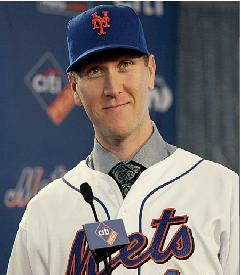 Today, at Citi Field, the Mets unveiled new Left Fielder Jason Bay. After Bay made an opening remark, Rod Gilbert, a New York Rangers Hall of Famer presented Bay with a New York Rangers “Bay” number 44 Jersey (Two Times Bobby Orr, as Gilbert said.) Here are some quotes from Bay. After the press conference Bay spoke with Kevin Burkhardt of SNY.